We start off our jaunt through Northern Cambria County and Clearfield County with a stop at the Patton Wind Farm. This picturesque wind energy production facility has an observation deck where you can watch the windmills in action and the surrounding rolling hills. The nearby Rock Run Recreation Area is an ATV park with many miles of trails for your all terrain vehicles and snowmobiles. This is one of the few facilities that has trails that are exclusively for ATV usage. The name may be a little misleading, for this is not a federal recreation area, but rather a privately owned facility that allows for ATV enthusiasts to have a great adventure through a nicely wooded property with many rolling hills. A view from Rock Run Recreation area, overlooking the nearby wind farm. Next we head into rural Clearfield County to Irvona. This bridge pier caught my eye. I figured it was a railroad bridge pier, but I was not sure what line it could have been. 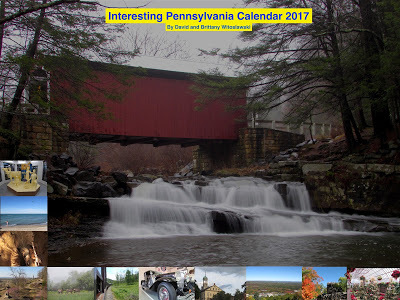 This area was home to main lines of the Pennsylvania and Northwestern Railroad, and the Clearfield Southern Line. Both of which would be absorbed by the giants, with the former going to the Pennsylvania Railroad, and the former going to the New York Central. Lumber and coal were the primary industries in this little town. Several short spur lines were also operated from the borough as well. So we have a mystery, what railroad did this pier belong to? While you are contemplating the mystery, feel free to cast a line into the stocked trout waters of the Clearfield Creek. 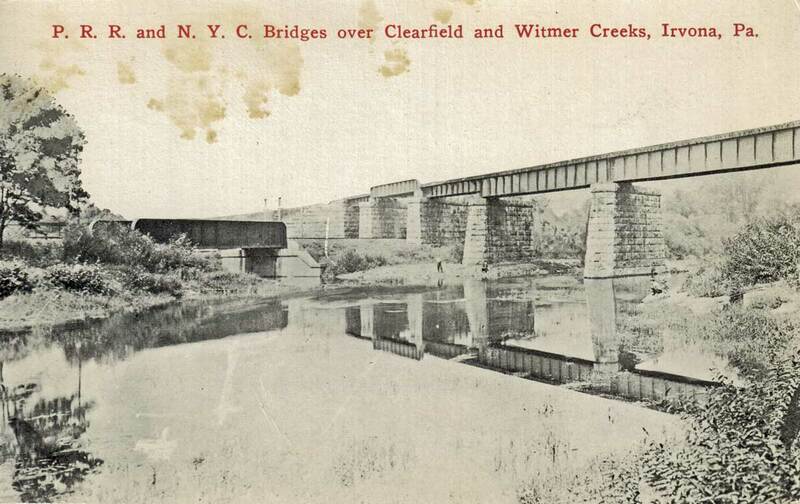 This postcard comes from Ellis Michael, and shows the Pennsylvania Railroad bridge on the left, and the New York Central bridge on the right. The NYC bridge's piers were all removed, except for the one nearest to the right. A flood control project was undertaken after floods devastated the borough in 1936 and subsequent projects lead towards to the removal of the other piers, leaving this one reminder of the New York Central's time in the borough. Here are the abutments for the PRR bridge. Is the intact bridge next to it for an old spur line in the background, or an unrelated bridge? It serves a small community park. Mystery solved! I love finding little remnants like this an trying to piece together what they once were. This stretch of the Clearfield Creek is beautiful. A sign for the PA DCNR flood control project in the borough. Here is the McGees Mills Covered Bridge, the only remaining covered bridge on any branch of the Susquehanna River. Here is an article that we wrote about this cool bridge. Now heading out further into the countryside, seeing rolling fields of wildflowers. We were tipped off to going up to this area since the road was named "Tower Road." That often means that there was once a fire tower on the road. This was a major lumber area and the bulk of it still remains wooded. Forest fires were always a threat, so the state created a huge system of fire towers, before the days of banks of camera views, cellphones, and other technology that can tip off everyone of a major fire. Not many of these fire towers remain, though the ones that remain provide spectacular views. Naturally, where there are large fields like this, border species like the PA state animal, the white-tailed deer, are sure to follow. From this point forward during our drive, we saw deer almost non-stop all of the way back to Pittsburgh. Granted, our drive was stopped with a little turkey traffic jam. Later on in the ride! Such beautiful animals. Hanging out in such a beautiful rural and agrarian landscape. "Eh, if you want to keep an eye on them, go for it, back to the grass!" "Ok, I will watch now!" What can I say? These rural areas are gorgeous and worth going to for an adventure! The bridge next to the PRR bridge appears to have been a road bridge. Penn Pilot aerial views of the area are very interesting as there were at least two PRR branches and the NYC branch.